Tablet holder for application to walls. Features a swing arm for ergonomic readability of tablets when fastened to walls. Tablet holder for application to walls. 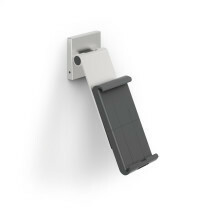 Arm with variable angle for ergonomic readability of tablets when fastened to walls. Slim-line, wall-mounted tablet holder for the professional display of tablets for a variety of applications.